Enjoy the sun all year long! If you like to enjoy your outdoor space while being in the ambient temperature of a house and without having to face the wind, rain and insects, the addition of a sunroom or a solarium could be perfect for you. Building a sunroom is the ideal way to add living space and embellish the exterior styling of your home. It is a permanent solution that will enhance the value of your home by giving it an exotic character. Make your sunroom the brightest place in your home. Your dream solarium can be designed the way you want it. You can have panoramic windows to enjoy an incredible view and let in the light all year round. You can have mosquito net windows and the opportunity to open and enjoy the pleasant breezy summer days. No matter what you're looking to add to your home, speak to one of Reno-Assistance's renovation advisors first. They will answer all your questions and help guide you through every step of your project. Building a solarium is a project to expand the house. 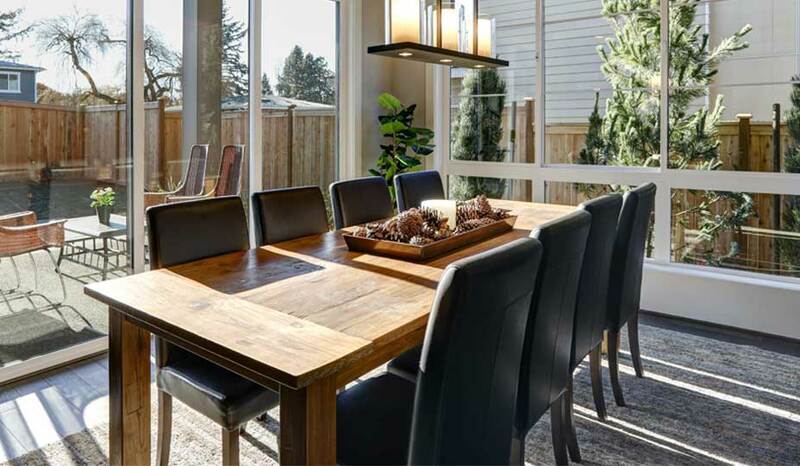 You can choose to extend any room to the outside, create a new living room, studio or dining room. This extension is versatile and can have several appearances or functions, depending on your needs. Whatever you do, adding a solarium will optimize the brightness of your interior. It'll fill your home with natural light, and will greatly increase the resale value of your property. Three season solarium – As the name suggests, this is not an option for winter, especially with the winters that we have here in Canada. Four season sunroom – This option allows for the room to be heated and cooled so you can enjoy it comfortably all year round. This is where the expertise of our home addition contractors comes in. Our renovation advisors, with thousands of projects to their credit, have the expertise to help you choose the contractor you need to plan your project and build your solarium. Experts in four season sunrooms! Get information and permits from your city. For all expansion projects, it is important to verify what you have the right to do, and not to do, with the city. Municipality zoning and by-laws vary from one city to the next (sometimes even from one street to the next). Verifying first will allow you to know the possibilities and constraints of your project and provide you with a better starting point and avoid much wasted time. It's also important to know what resources you will require (e.g. technologist or architect plan, licences, etc.). Call Reno-Assistance. From this point on, we can help you with the most difficult stages of your project. You will have a renovation advisor who will help guide you through the early stages of this project which are not often simple. We will refer you to the professionals with the skills and experience best suited to your particular project. We find you an architect or a technologist. You will need a plan from an architect or technologist for your project. It's necessary to establish an accurate depiction from which the contractors can bid and follow to a tee throughout the completion of your project! We find you the right contractors. Once the plans have been obtained, your renovation advisor will thoroughly review the plans to understand your requirements and find the experts in your area who will be able to come and meet with you at your home to discuss your project. After an assessment and gaining a thorough understanding of your objectives, they will provide you with an obligation-free estimate. Choosing a contractor. With the help of your advisor, you can review the various quotes received, evaluate and compare them to arrive at an informed final choice! Happy Renovations. 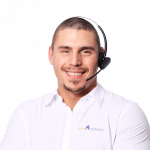 With our free renovation advice service and our 360°‎ Verified Contractors, the ultimate goal is to achieve a successful renovation and there is no better way than with us. 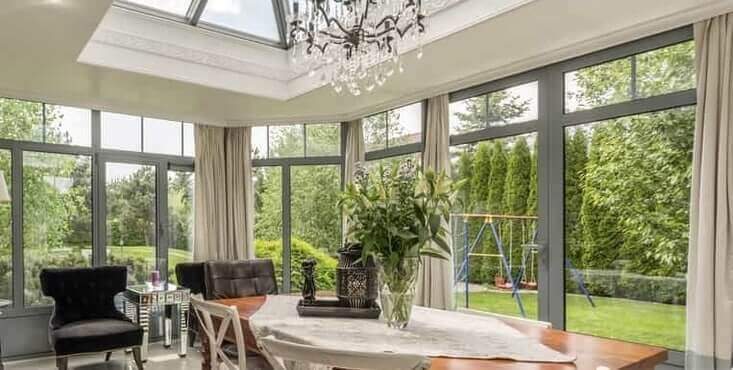 What is the price of a sunroom? The total cost will obviously depend on the overall size of the room and what materials you are looking to use for the interior finishing, exterior cladding, roofing, windows, flooring, etc. It is also important to take note if you want to use cheap, mid-range or high-end materials. Once the materials have been identified and the contractors have met with you, we can get a better idea of your requirements. However, we can tell you that based on several projects we have seen completed in the past, a four-season solarium with a finish similar to the one pictured above, the approximate market price is between $145 to $185 per square foot. 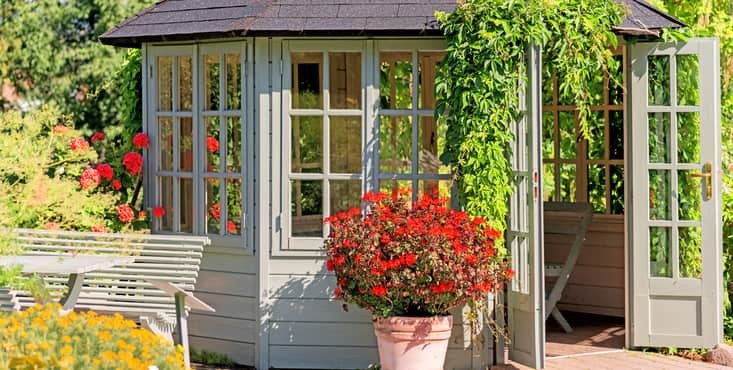 In addition to these two options, if you're looking for a solarium-style space but completely detached from your home, there is always a gazebo! A gazebo that can be custom-built and shaped to your liking can contribute to a different look for your home. A gazebo can be installed anywhere, at high or ground level. It can be closed with mosquito nets or open and is built with a section of roofing that will protect you from the sun and rough weather. The garden pavilion (wooden gazebo) is a cheaper option to consider than the solarium or wooden porch. This is great if you have a slightly more limited budget. Or even if you are not looking for the upscale renovation, or if you just prefer that your bright sunlit space is detached from your main house. Beginning your solarium project should be as inviting as a summer breeze. Take full advantage of your property and the sun by adding a solarium, a veranda, or a gazebo to your property. Not only will you have a new room to absorb all this vitamin D, but in addition, your home will increase in value. You should see it as an investment! It'll improve your quality of living and house resale value! Whatever the model of veranda or solarium desired, do not hesitate to contact us to discuss it with our Renovation Advisors. It's free and without obligation! Get up to 3 quotes! It's easy and FREE. When you begin your solarium or veranda construction project with Reno-Assistance, you have immediate access to your own renovation advisor. They will review your project with you to identify your needs. Then, they'll send you up to three solarium contractor specialists from our network of contractors to bid on your project. Only contractors who have earned our 360° Verified seal of approval are the right contractors for you and they have satisfied customers to prove it to you. To start your solarium project now, simply fill out our contact form on the right! You'll obtain up to three free, no-obligation quotes. All the difficult decisions you have to make will be sorted. The solarium contractor you have chosen with your Renovation Advisor will work on all the details of your project with you. They'll help you choose the right materials, plan the assignment, and ensure the successful completion of your solarium. And we will be there with you, every step of the way... always free!